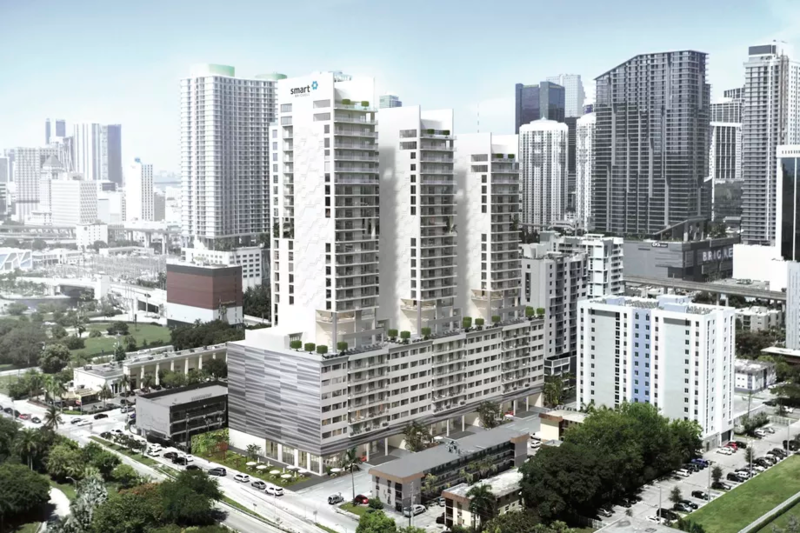 Smart Brickell will break ground in April 2018, according to Curbed. The project includes three towers. A broker for the project says that 35% of units in the first tower have been sold, with a second to launch sales in 1Q 2018. Unit sizes range from 558 to 878 square feet, with prices from $290,000 to $490,000. The three towers will have 170 condos, while 150 hotel rooms and 30,000 square feet of retail space will be located in the pedestal. Hernando Carrillo is the architect. Habitat Development is the developer. I don’t know about the hotel, but the tourists will love it! “Smart” is a clever way to market small. What makes the building ‘smart’? Will it feature tons of automation? yes it will….go to the website….pretty loaded with gadgets!!! I like the form, but the blank east/west walls covered in multi-colored scattered “art” look like a flawed afterthought. I know the lower area faces I-95 to the west, but some more “smart” secondary use and street interaction would be better. Developer was Smart not to include in the rendering that I-95 is one block away. Uh yeah, showing potential customers that they can have all the trappings of Brickell along with being within a close proximity to downtown also. But putting up with a freeway a block away is certainly a deal breaker. Good thing you’re not a developer.